RF Solutions (Brisbane) had 25 units come in last week. I believe all 25 were pre-sold. 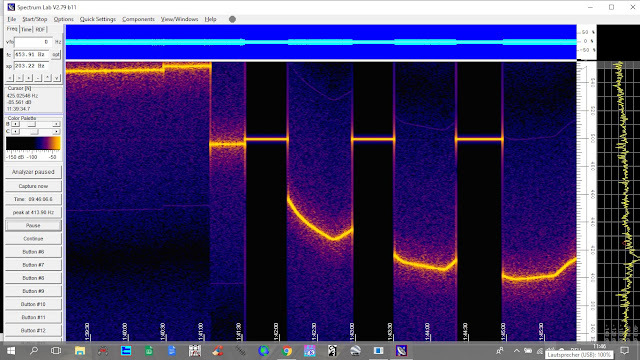 VK4GHZ wrote: Was this from Rex VK7MO? Sorry yes, from Rex. Odd he usually writes his name and callsign. I didn’t notice as I knew it was from him and written in his style. Have all beacons into each memory stack. 100 for each band used about 25 on 2 15 on 432 10 on 1296. Then fun started, how does one use the preamplifiers? Mast head activated on 144 for starters using PAGE 4 txing rxing Preamplifiers. and I guess you need to do that for each band. The PAMP/ATT button does same thing. 9700 finally does justice to the MH144 amp don't need attenuator anymore and listening to RGL and watching the scope is pretty cool. Forward scatter, AE pings and a waterfall.. yeah that's cool..
More on 432 1296 soon..
Last edited by VK3ZAZ on Wed Apr 17, 2019 7:00 pm, edited 1 time in total. why would you put a $2500 radio on wspr? VK5GF and I and 7HH only ones on anyway so my $350 IC910A fromTokyo ham fair is all that mode is worth. I work my backside off in middle of night fixing tv stations because we cant find any new chums to take on the work load. 50 years this July BOCP #7 and still working at 73YO. The radio is one months pay, so be it. Its only money or a good set of golf clubs..
You cant take it with you old timer..
"why would you put a $2500 radio on wspr?" Clearly the radio would be used for other activity on VHF/UHF. WSPR can be used when I am busy on other bands, doing P/W in the shack or what ever. I would like to have WSPR available if I want to run it. My current radio is not stable enough to run WSPR on 2mx and above. I expected that the IC-9700 would be be. Seems, in it's current state, it is not. "APRS tells me more about 2M prop than WSPR"
Do you really think so? If so you have a lot to learn about TRUE weak signal VHF/UHF working. My comment about "good luck" was sincere. Seems your took it otherwise. there is a larger number is use. The IC-7610 sure had problems when it hit the field and it seems the IC-9700 has serious flaws. Another good reason to delay a while is the likelihood of a significant price drop after a few months. How the rest of your post relates to the subject escapes me so I have no comment. went through Adams data base before it is culled and callbook and entered all beacons and their callsigns and grids which then appears in small text below the frequency. Each band has 100 entry points so it will never be filled up. Have logged VK5VF VK3RGI and VK3RMB so far receiver combine with icoms somewhat dated mast head amps is brilliant on sensitivity. A word of caution the RF Gain has to be set at 1200 oclock not at 7 oclock. set is acw reduces rf gain, rf gain is max at top of the hour. and the s meter does not move up as you reduce gain unlike many radios..
Screen times out overnight which is good. you can set the rf gain to rf gain only in menu but it still full rf gain at 12 noon for some reason..
144 performance over the 400 k path to VK5VF is extraordinary IC706 not withstanding. 1296 stable and sensitive monitored VK3RMB all night radio rock solid down to noise level..
crisper and more consistent copy. Right now hear it in noise on 910H undetectable on the 9700 all things being equal, these radios this location. but you will need 5v to run the gps dongle or find another way. We do better with APPRS so just find your locaation and enter it manual save your money. Anyone hooked up to a LAN yet and got time from NTS server?? About to try the d-star set up with the Horsham repeater at 140 km. FYI, opinion from Adam Farson, VA7OJ, regarding feeding the IC-9700 with an externally-locked 49.152 MHz reference signal. Good thought…but the only solution I believe Icom will accept is one in which the frequency tuning of the internal master oscillator remains under the control of the FPGA. This dictates a 10 MHz external reference, as the FPGA code was written to process a 10 MHz signal and apply the correct control voltage to the internal 49.152 MHz VCXO. Replacement of the internal VCXO with an external lash-up is out of the question. The phase noise performance of a direct-sampling/DUC SDR is critically dependent on the quality of the ADC/DAC clock oscillator, the clock distribution circuitry and the cleanliness of the clock power source. Board layout is also a critical factor in this area. Any major change would require a complete redesign of the ADC, DAC and clock areas of the main board. I am hoping that Icom will replace the existing “rough check” comparison scheme with a PLL coded in FPGA firmware. The PLL loop filter will need to have a cutoff frequency sufficiently low to minimise the impact of phase noise in the applied external reference signal. Sorry, I am not in a position to distribute my copy of the service manual. It was furnished to me in confidence. Many people are confused about the 10 MHz reference lock input on the IC-9700. And so was I. While all of us expected the VCXO was locked to the 10 MHz input (which in most cases will be locked to a GPSDO) it isn’t. Unlike the new IC-7610, which is locked, the 10 MHz input on the IC-9700 can only be used to calibrate the transceivers’ VCXO. And even this doesn’t seem to be most accurate. According Rex (VK7MO) tests, he had a 4 Hz error on 144 MHz, a 40 Hz error on 1296 MHz. Icom has work to do to fix this (and the ALC / Power Overshoot) error. A fix could be a (more) permanent lock/sync, but a fix could also be made in the fan controller, since the temperature is directly involved with the IC-9700’s drift. People using the IC-9700 for FM (repeaters), satellite, FT8, etc. should not worry. People using the IC-9700 for weak-signal modes and EME should, and not putting the old locked IC-910(0) or TS-2000 on sale, yet. "I did some tests last night with the 9700 on 2m. The drift looks like a bow on my scope. My conclusion was that the TCXO is fine, but too slow to compensate the airflow (delta in temperature). So i stopped the airflow by just blocking the output of the blower...i know, not the professional way, but i run the TRX only at 10W. The blower immediately kicks in after PTT. 1 minute key-down, deviation below 1Hz, THAT is fine for me. Next step is to modify the blower, i will run it permanently and see what is happening. Or shield the TCXO against a fresh breeze. Will see…. Last edited by VK3ZAZ on Thu Apr 18, 2019 8:33 pm, edited 4 times in total. The old AGC spike issue explains why I tripped my 432 amp today thank goodness for protection. if its on it aint ON! using the RF Sense with a THP HL350V on 144 and HL-250U 432. On SSB the Tx delay is ok, but on CW using break in the results in an instant SWR spike as indicated on the 9700 SWR meter. it occurs on the key up leading edge of the waveform and one assumes this is occurring in the first few ms before the amp relay clicks in presents a good 50ohm match. Damn you Icom. Again, and again, and again. Yes. Alse the IC-9700 is equipped with the famous ‘power overshoot’ or ‘ALC overshoot’ issue most modern Icom transceivers have. Apparently Icom can’t get a grip on this issue. Bad news for people using transistor based amplifiers (SSPA) in SSB mode. Since the IC-9700 had a ‘TX PWR LIMIT’ function, setting this to 7%* will prevent the amp from going in protection mode. The bad side is that the amp only running about 50% of the effective power. * In my case I’m using a Gemini 2-500 amp with 4W drive level requirement. If your amp needs 10W input, raising the 7% to [try something like 13%] the value you need. And no. 7% does not mean 7 Watts, thus overloading. The value (percentage) isn’t linear. Measuring the (avg) output will tell you. Last edited by VK3ZAZ on Thu Apr 18, 2019 8:26 pm, edited 2 times in total. This is worth posting looks serious? My Icom IC-9700 is connected to the network. And, as a freelance linux and infrastructure (security) engineer, I could not resist to do a port-scan on the box. The first result was port 23, used for the legacy telnet service. Loggin in was easy. No username and password required to get a shell. Quite shocking and a real security risk for devices directly connected to the Internet. That’s a receipe to get hacked within hours. Since the # would suggest it’s a rootshell, the available commands are quite limited (yet…). But I assume it’s an RTOS shell. I’ll find time to figure it out. The problem with new transceivers is the lack of support for drivers in programs like Ham Radio Deluxe, WSJT-X (OmniRig), N1MM+ and MicroHam drivers. Just to name some programs I juse often. After playing around I found a way using the IC-9700 with WSJT-X by emulating an IC-7300 wich has about the same architecture. THE MOST IMPORTANT LESSON EVER(!) WITH FT8 -> Check your audio! When starting to make a QSO, check your audio level. Use the Meter section and be sure the ALC does not more more than 1, 2 or 3 blocks. If you’re running to much audio, the ALC will kick in, crating harmonics, splatter, etc. I’m sure people will just ignore your CQ, if they are able to make a decode anyway. Use the slider on the bottom right. In my case it’s set to about -25 dB. For receiving: Use ALC slow and change ‘6 sec’ to ‘off’. This is by far the best setting to receive digital signals (also on the IC-7300) in crowded bands and it avoids strong signals (or people disrespecting the ALC setting, we call them egoists) wiping weak signals away. not checking the spelling errors.. In mean time things can only improve for the better. cheers that's all from me, going to play with the new radio..
slow qsb out of sync with 432 144. Adam will have to resurrect his Mutli-send kit for this radio too. No PTT per band on any of its ACC sockets either ! I have one never assembled hope socket is same.. I forgot that my browser is set to auto translate! VK2XAX wrote: Adam will have to resurrect his Mutli-send kit for this radio too. I'm well ahead of the curve! Started developing a solution back over 12 months ago, known as the SEQ-9700. It's a full-blown sequencer, with over 50 parameters you can adjust via it's own 2.4" touchscreen interface. It uses CI-V data, so it will be plug 'n play. I have no interest in voiding my 5 year warranty, and I expect a lot of IC-9700 owners will feel the same. Have had Rev 1 PCBs sitting here since July 2018, but don't have the spare time to work on it right now. I'm taking a break from the renos in 4 weeks time, and will continue working on this project then. It's a lot more sophisticated than a (circa 2013) IC-910 Multi-Send. 3D render of the next revision PCB... so far. There is more hardware to add to accommodate extra functionality that has been thought of since. Plan to engage one, perhaps two, local real-world testers out there before a production version goes ahead. Don't want to be selling beta version products requiring firmware update only weeks after it's released, hey Icom! Thanks for having the forethought to fill the gap, so to speak. The RF spike is seriously bad. And my THP amps seriously dated. Radio hearing Tassie and Gipps beacons all day hears well and interfaces with the mastheads just fine. I presume it will be in English?